The softbox is one of the mainstay lighting units found in photographic studios. An assembled lightbox and off-camera flash on a stand. 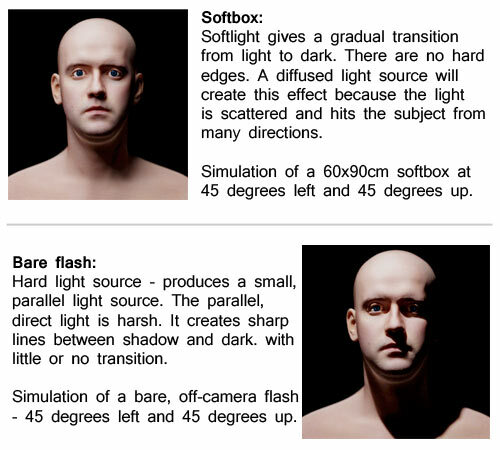 Softboxes are so successful because they provide a diffused soft light. 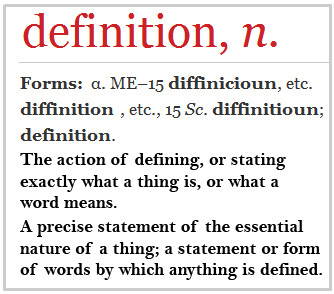 The light does not have hard, well defined edges – there is a transition from light to dark with gradual change. The softer the light the more gradual the change from light to dark. The softbox works because inside the box light bounces off the internal surfaces. The bouncing light scatters itself so that light emerging from the front is going in many different directions. This random scatter, from the front wide, translucent screen means the light hits the subject with little focus. 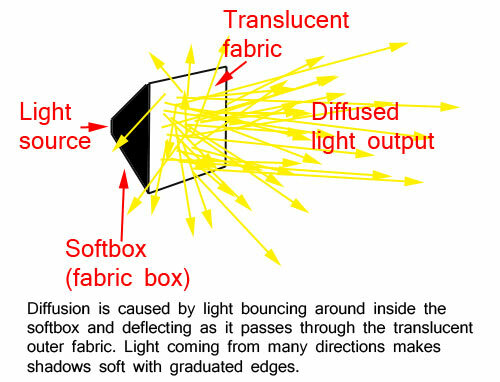 Softboxes create diffused, soft light. Softboxes can be constructed out of a range of materials. However, they take their name from the use of wire-framed box shaped light shades made from nylon (hence softbox) which can be large and light. The outside is usually black to prevent uncontrolled light reflection in the studio. Inside there is usually a white, silver, or gold reflection surface which may be fixed or inter-changeable. It is this surface that causes the light to scatter inside the softbox before passing through the front translucent panel. To get a less softened, wider focus light the front translucent panel can be removed and a small back-reflector can be can be placed in front of the light source instead. This is not common as photographers tend to prefer the use of a beauty dish or umbrella to scatter light with a wider focus. The use of a loose fabric grid on the front of softboxes is more often used to reduce the softening effect. 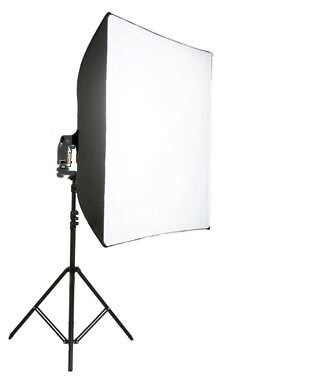 Softboxes are normally mounted on a stand, bracket or mounting of some sort. However, very small softboxes can be camera mounted. Standard three legged studio light stands are the most common form of mounting for softboxes. It is a simple and flexible way to use them as they can easily be picked up and positioned as needed. Light stands generally have a standard brass fitting (male) on top that fits into a female fitting on the light unit or softbox bracket. The universal fitting allows different light fittings to be swapped onto the stand.